PBS FM was built by members, and continues to function because of them! There are some pretty great stories about how some of our members first became involved with the station, and we couldn't help but share them with you. We had a chat to Dr. Kate Shaw who is a PBS Friend for Life. Can you remember when you first found out about PBS? I found out about PBS when the studio was set up at the top-end of Fitzroy Street in St Kilda. Gaagh, too long ago! My old friend Cameron Paine was involved in PBS from the outset – he took me there. What made you decide to become a Friend for Life member? 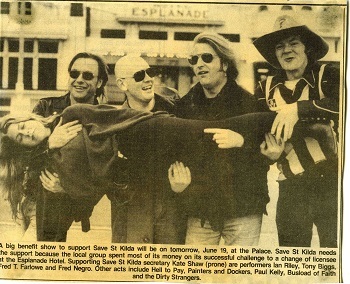 We were part of the 'Save St. Kilda' movement back in the ‘80s – it was a kind of post-punk, anti-gentrification, retain low-cost housing, hang onto the places with soul, type movement. It was clear to me even then that a low-threshold into arts, activism, music, comedy, performance of any kind really, could be a life-changer. Many years later Paul Kelly said the pubs were his university … that said it all. People were making beautiful things, crafting, producing, playing, because they could, because they didn’t have to focus exclusively on paying the damn rent. It became political, always was I guess. Arseholes wander in and go: woah, we can make money here! With no regard to what’s there, they systematically destroy it and then complain about the crazy kids with nothing else to do but get trashed. Much later when I did a doctorate at Melbourne Uni I focused on what place, sense of place, sense of belonging and community, mean to people, and to society more broadly. Live music venues in particular, and music and performance in general, became a recurring theme. I mapped their steady progression from the south-east to the north-west of Melbourne because of increasing rents and complaints from new neighbours who like the cachet but not the disruption. Fair Go 4 Live Music and SLAM continued in that vein and, with PBS and RRR, can take much credit for Melbourne’s amazing music scene. PBS is a microcosm of much of what I believe in, it supports local venues, local bands, builds its own sweet community in so many ways. And plays great music! When I became a proper urban geographer at Melbourne Uni I realised I could put my money where my mouth is. What is your favourite show and why? Well, my heart is with Pierre Baroni and Soulgroove '66 but Sunday mornings are essential, The Gospel Show and Mohair’s Blue Juice. Why? Because it’s soul baby. If you'd like to find out more about becoming a PBS member or Friend For Life, visit this link, or give us a call on 8415 1067.